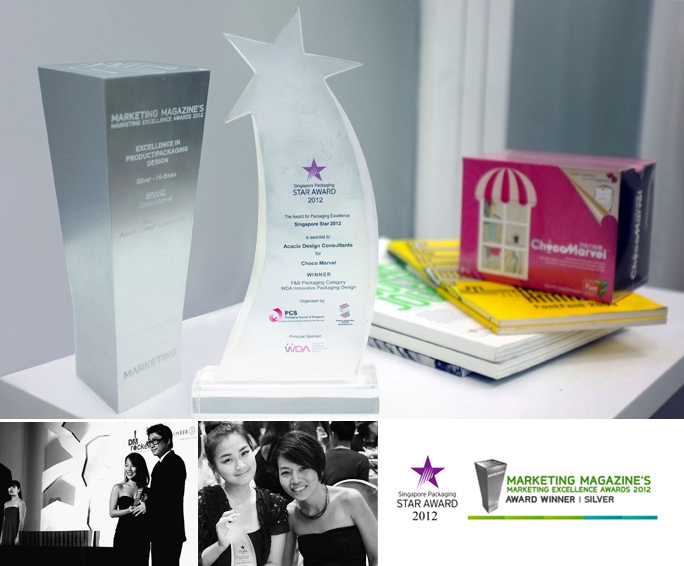 Acacia Branding & Design Consultants picked up Marketing Magazine's Marketing Excellence Award and the Singapore Packaging Star Award in back-to-back award ceremonies on the 28th and the 29th of November. These add to the list of commendations for ChocoMarvel in 2012, which had earlier clinched the Cozy Cot Holy Grail Award. While the prestigious Packaging Star Award is organised by the Packaging Council of Singapore and honours companies with innovative and creative packaging design, Marketing Magazines's inaugural Marketing Excellence Awards is Singapore's premier event celebrating excellence across the marketing communications services spectrum. It recognises organisations that have pushed their brand(s) towards measurable success, through sound and innovative marketing strategies. The awards were held on 28 November at Shangri-La Singapore and the winners for the night are decided by a distinguished panel of judges comprising senior professionals from agencies, academics and experts from the industry. If you'd prefer not to receive 'Branding News' from Acacia, click here.